Russell Guyver is originally from London, England. He has followed a varied career as conductor, violist, composer and educator. As a violist he has played in many orchestras including the Scottish Chamber Orchestra, English National Opera, Royal Ballet and the Orquesta Sinfónica de Venezuela. He has appeared as conductor, soloist and chamber musician on four continents and is a guest artist at several annual music festivals in the United States and in Brazil. For many years he has been violist with The London Music Club Quartet. Russell Guyver is co-founder and first Artistic Director of the String Orchestra of the Rockies, for many years now a flourishing professional chamber orchestra based in Missoula, Montana. Also active as a composer, he received an Emmy for his score of a PBS docudrama and in 2010 he premiered his one-act electric opera Opera[tion] World Peace, co-written with Brian Luedloff. Recent conducting highlights include the Thailand Philharmonic Orchestra, Orquesta Sinfónica del SODRE, Cordas de Volta Redonda, Orquestra Sinfónica da Barra Mansa, the Colorado Dance Theatre Orchestra and, as always, the UNC Symphony Orchestra. Guyver is Director of Orchestras at the University of Northern Colorado. Under his direction, the UNC Symphony Orchestra has been awarded “Best U.S. College Orchestra” by Down Beat magazine ten times. 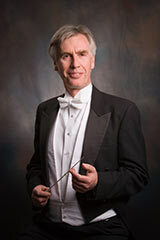 Russell Guyver received his musical training at the Guildhall School of Music in London, and, more recently he earned a doctor of musical arts degree in conducting at the University of Kansas under the guidance of the late Brian Priestman, former music director of the Denver Symphony and many other orchestras throughout the world.